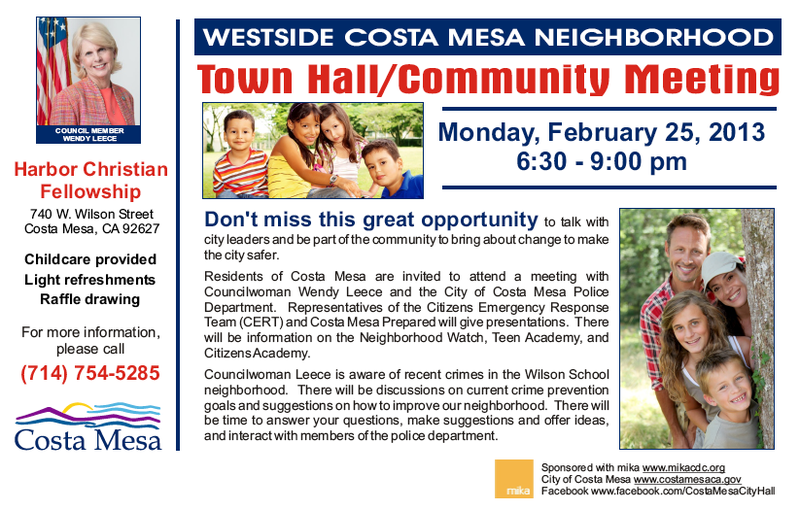 Costa Mesa Councilwoman Wendy Leece will host another in her series of public safety town halls next Monday evening, February 25, 2013. The event will run from 6:30 - 9:00 p.m. at the Harbor Christian Fellowship, 740 W. Wilson Street. The flyer below has the details. Click on the image to enlarge. I hope she is feeling better and doesn't need to reschedule this planned event. We missed her at last nights city council meeting, but her vote wouldn't have made any difference in the outcome of the issues before the council. This is happening the same night the Planning Commission is hearing the proposed new development on Victoria, which has plenty of community interest. Not good timing. Could Riggy please send Code Enforcement over to that church. It is the biggest eyesore from the Joann St. "street-view". The building's graffitti "tag cover" (i.e. a huge beige painted square) has never been repainted to match the church's white paint. So for several months it's been proudly displaying it's "ghetto neighborhood" appearance, as well as, it can only eventually encourage more tagging. Also, the church's landscape is rarely "to code" because the so-called "grass" is actually overgrown weeds during the springtime. And it's virtually a barren desert of dried dead weeds in the summertime, especially the Joann St. sidewalk "weed-easement". It appears that all of us nearby "homeowners" must maintain "green lawns", including our sidewalk easements. But, somehow, the various local business operators (i.e. churches, non-profit schools, commercial apartments,duplexes & multi-plex property owners (i.e. the "Slumlords") do not. Also, for the past several Saturdays there's been a ten foot stretch of "clothes for sale" hanging off the church's parking lot fence from the nearby apartment's weekly "lawn sales". I have only held one garage sale just like the City wants (i.e. 1-2 in a 12 month period) And it's professionally sponsored by my local realtor as an annual spring-cleaning "Neighborhood Garage Sale". So does Code Enforcement even assign a CE Inspector to work on Saturdays & Sundays to specifically document/regulate the actual garage sales throughout the City? I have never seen a City CE car drive through my neighborhood on a weekend to be there to document any such activities. 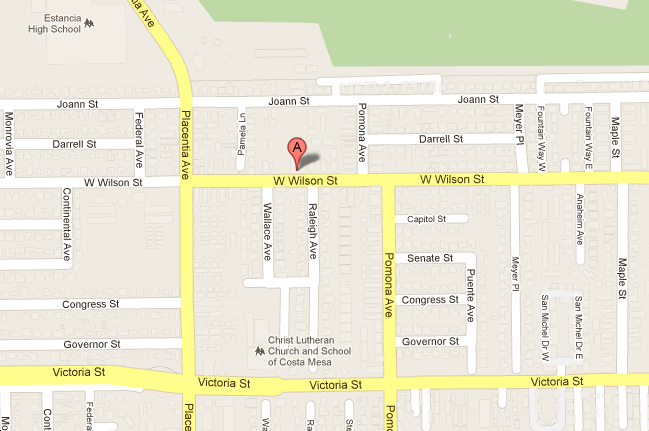 Also, what ever came of the CE's proactive "neighborhood pilot program" assigned to this area? And, even more importantly, has it even worked? The Westside property values would definitely increase only if the City's mandated codes were systematically enforced amongst ALL property owners at all times not just a select few after an official complaint has been filed with the CE Department. A proactive neighborhood "code enforcement period" would most likely encourage CM property owners to abide the rules, as well as inform the majority of their foreign-born rental tenants of our their new City's ordinances. Westside, you need to come to the meeting and mention these things. 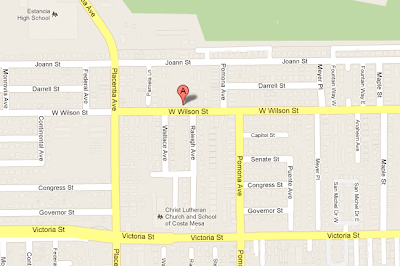 Also, complain about the drug house (not rehab) on the corner of Placentia and Joann. It backs up to the high school. There is no "rehab" about it, its strictly drugs. There is a lot to talk about. Timing: I think the P.C. meets on the 2nd Monday of the month. Is this a special meeting? Could Riggy send Code Enforcement to the empty lot on 17th and Superior to collect those big "Bever for Water District" signs that are laying around. Talk about an eyesore, and signs are pretty bad too. Westside, thanks your for comments. I hope to be at the meeting and would like to meet you there. just wondering, I'd like to meet you too. Sorry James...emergency came up...funeral out of town this weekend. Won't be able to make it. But I will talk to attendees later. Can anyone tell me how Wendy defines "safe"? I hear her say it all the time. But I have no idea what she means? is it the # of cops or fireman? Besides asking the question. 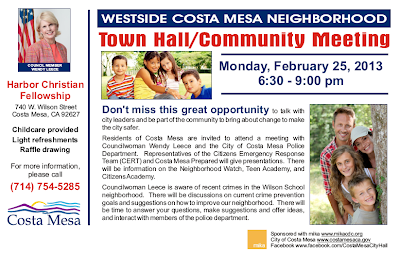 What is Wendy actually doing to make Costa Mesa Safe? 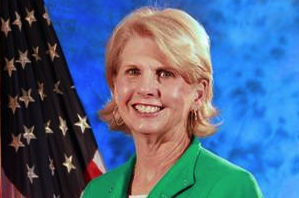 Well, just from my perspective, in addition to making decisions as a council member, she's held these Town Halls to provide heightened awareness to members of the community who might not otherwise have it. I've attended most of them and think those from the communities who were there left feeling much more knowledgable about how the police and fire folks work to protect us. If you inquiry was sincere, attend the meeting tonight. If it was just a snarky backhand at her efforts, then just keep them to yourself. At EVERY one of the previous events at least one additional council member made an appearance. Nope, other Council at EVERY is not accurate. By holding meetings got it. Anything else? Any proposals? Any new programs? Any success in terms of anything measurable? For the past several years she's been on the short end of the majority - 4-1 in many cases. She couldn't even get a discussion going on important issues. But you know that, don't you? Wendy has gotten down in the trenches and met with people concerning their neighborhoods and has actually met with people who are having issues and/or problems. She has been doing this for a few years. She is a great teacher and from what I understand, she reached a great deal of people last night. R U, and Safer Mayberry, sounding a little bitter today?